When Thomson Reuters acquired the UK-based Practical Law Company three years ago, the legal industry generally reacted positively, although no one knew quite what would come out of the acquisition. Practical Law sells “know-how” for transactional and corporate lawyers, which means that it sells various resources that literally help lawyers know how to do specific tasks. These include workflow tools, practice notes, form documents and clauses, and checklists. Until now, however, no product has fully bridged Practical Law and legacy TR products such as Westlaw. 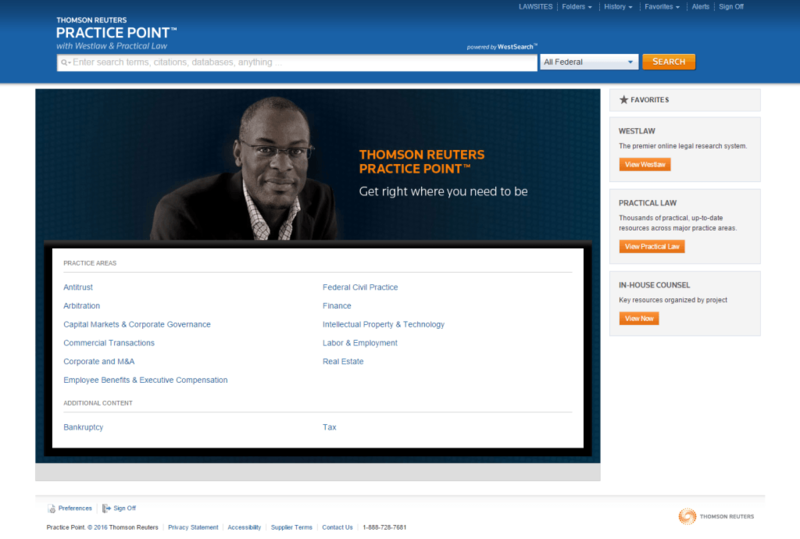 That changed when, at an event last month in New York, TR introduced a new product, Practice Point, that is the most robust integration of Practical Law and Westlaw to date. Designed for transactional lawyers and corporate counsel, Practice Point is a task-based workflow platform that pulls together content from both Practical Law and Westlaw to deliver the resources that are most relevant to any given task. This is accomplished through editorial oversight. For any given task, TR editors have selected the most relevant and useful content from both Westlaw and Practical Law. Content is organized within a taxonomy, designed by these same editors, that reflects the main tasks that lawyers perform on a daily basis. “We’re bringing Practical Law and Westlaw together in a way that transactional lawyers will get the same value out of Westlaw that litigators do,” said Emily Colbert, vice president, Global Workflow Solutions, at a recent TR event announcing the product. To bring together Westlaw and Practical Law. To organize it around what lawyers do. To deliver only what’s important to lawyers in whatever task they’re doing. That takes you to the main page for that practice area. If you always work in a particular practice area, you can make its page your standard start page. Subscribers in corporate law departments get a slightly different start page. They can select any of the same practice areas, but they also get the option of choosing to start with a specific type of project. Options here include acquiring, setting up or disposing of a business; financing a business; business operations; legal and regulatory compliance; and managing risk, claims and litigation. Within each practice area or project page, you have the option to browse and drill down through content by task or by content type. For example, on the Intellectual Property & Technology page, some of the listed tasks are Patent Counseling & Transactions, Trademark & Right of Publicity, Copyright, Privacy & Data Security, and others. Nested under each of these are increasingly specific levels of tasks, any of which take you to the appropriate task-based content page. You can also browse by content type. Content types include Practical Law, cases, statutes, secondary sources, forms, briefs, trial court documents, expert materials, and many others. However you start, you will find your way to pages that pull together the content best suited to that task. Depending on the task, this might include Practical Law content such as practice notes, documents and clauses, checklists and toolkits, and Westlaw content such as case law and statutes, treatises and secondary sources, forms and more. As you drill down, the types of content and practice tools change to reflect the task at hand. A feature unique to Practice Patent is Rulebooks. These are collections of the key federal laws, rules, regulations and agency materials related to specific types of corporate matters such as securities offerings, SEC disclosures and reporting requirements, proxy solicitation and others. State Q&As, allowing you to compare key areas of law for a topic across multiple states. Case Evaluator, allowing you to analyze verdict trends related to a topic. What’s Market, allowing you to search, review and compare summaries of recent deals and filings. Of course, besides browsing all of this content, it is all fully searchable. In addition, from within Practice Point, you can jump directly into either Westlaw or Practical Law and access the full array of their content. Still in the works for Practice Point is integration with West km. Watch for that later this year. What does Practice Point cost? That’s a question TR answers only with, “Call us.” However, the Practice Point website is currently offering a free trial, so give it a spin.